Throughout history, women have played a crucial role in cheese-making. Traditional cheese-making has generally been regarded as ‘women’s work’ - while the men were busy with farm labour, women were usually indoors rearing the children, looking after the household and making cheese. This fits with the rhythm of traditional cheesemaking; milk takes time to curdle and needs to be attended to for short periods of time, spread throughout the day. So in between the cheesemaking steps, women could do other chores, going back to the milk as and when necessary. By the end of the day the curds would be placed into moulds or made into small cheeses, the cream would be made into butter and so on. However, cheesemaking drastically changed in Britain following the Second World War, when many of these small family farms were closed to make way for increased Cheddar production. Since Cheddar stores well with a long shelf life and is able to be cut without crumbling, it was the perfect cheese for rationing where wastage would have been a big concern. Unfortunately, after the war had ended, many of these small producers did not start making cheese again. Recipes were lost. Cheesemaking in Britain had completely changed. But over the years since, this spirit of small-scale farmhouse cheese has been revived, in no small part due to some courageous women who have shown the same hard-working spirit of their predecessors. Read more below as we celebrate some of the Modern Women in Cheese. As we discuss women in cheese, we must first, of course, pay tribute to Mary Holbrook who sadly passed away earlier this year. She was instrumental in stirring our emotions when it came to the fragile and often unpredictability surrounding cheese making. Her lightness of hand and sureness of eye when it came to assessing milk and curds was not only astute but also unique as it was simply that she knew by instinct and her instincts were always correct. Her beautiful hillside farm was as nature would have intended and pasture land strewn with wild flowers, clover and grass seeds all growing at their optimal seasons and enjoyed by the animals grazing there. Mary wanted not only her life but the life of her animals to be one of contentment. Her legacy lives on as she welcomed trainees to work with her, and there are numerous young cheesemakers – many of them women - who have gone on to making their own cheese and refining their talent. Before cheesemaking she was an intellectual and gave it all up to instead use her formidable knowledge and ideas in a very simplistic way. While we are looking primarily to modern women in cheese, we could not forget the legacy of this French cheesemaker, who, local legend has it, invented Camembert in 1791 following the advice from a priest, Abbot Charles-Jean Bonvoust. Her style of cheese has been much copied throughout France and the rest of the world, but perhaps even more interesting than her contribution to this recipe is that she also enlisted the help of a gentleman by the name of Eugene Ridel who invented the thin wooden box made for the delicate cheese to fit into, thereby making it suitable for travelling long distances. This invention changed the way a soft cheese could be transported, making it not a local product but one that could be sent further afield to the City, one of the most monumental steps in the way we consume cheese today. Ruth began making Mrs Kirkham’s Lancashire in 1978 after her mother retired, passing down her cheese-making equipment, knowledge and recipe. Ruth transformed the old piggery into a cheese-making dairy and for many years she (along with her husband John) milked their herd and made cheese each day. Ruth’s son Graham returned back to farm and joined the family business; working alongside his mum to make the cheese we know and love today. Delicious eaten fresh & crumbly or, after a few months' maturing, when the cheese becomes denser and more full-bodied, with rich mineral, earthy flavours and creme fraiche tanginess. Errington Cheese are a small, family-run farm and cheese company started by Humphrey Errington in the early 1980's. Humphrey’s daughter Selina is following in the family footsteps & created Corra Linn; a ewe’s milk cheese along the lines of Manchego but with the natural moulds to the crust. Named after the highest waterfall in the picturesque Clyde Falls, the unique vegetal flavours come through with a hint of earthy sweetness. Jane created Cashel Blue in 1984 with her husband Louis. We can’t thank her enough for the role that she played in creating the original Irish farmhouse blue cheese; wonderfully balanced between the buttery curds and the persistently minerally moulds, this cheese is notably versatile. In 1992 the Grubbs expanded their production to include a ewe’s milk blue cheese called Crozier Blue; a creamy, slightly gritty texture - malty and sweet on the front, finishing with an expansive depth of spicy salt. Today Jane has retired, enjoying life on the family farm, and her daughter Sarah has taken up the mantle as a second-generation cheese-maker. 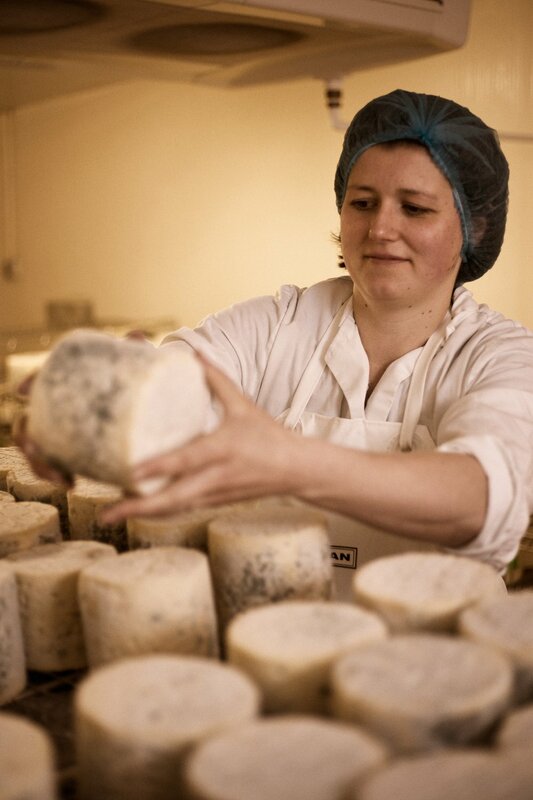 The cheeses remain of exceptional quality, with Sarah bringing a wealth of food & wine experience back to the dairy. A former school teacher turned cheese-maker, Siobhán joined her neighbours Meg & Derrick Gordon in their gourmet cottage industry and eventually took over the business in 1999, following their retirement. Siobhán is a firm believer in organic farming practises and today Saint Tola is still made in small batches, as the artisanal quality of the cheese is paramount to everything she hopes to achieve. The pastures are rich with herbs and stippled with wildflowers throughout, which adds a lovely floral finish to the close-textured goat cheese log with good citric acidity. Rose has been instrumental in turning her family farm into the Nettlebed Creamery. Bix: a bloomy rind rich buttery cheese has cream added to the curds to give the unctuous flavours a dense grassy sweetness with a yoghurt twang at the finish. The milk is from Merrimoles Farm’s organic 3-way cross herd (Montbeliarde, Swedish Poll and Friesian Holstein). A perfect cheese for Champagne! After reading an article about a goats' cheese maker in an old copy of 'Woman and Home' magazine, Rachel and her husband Fraser decided to abandon their previous careers and become cheese-makers. With milk from their own herd of pedigree Anglo Nubian goats & another local herd, today they make Sinodun Hill: a truncated pyramid with a nutty geotrichum rind. The pate has a mellow tangy flavour, with faint citrus notes. 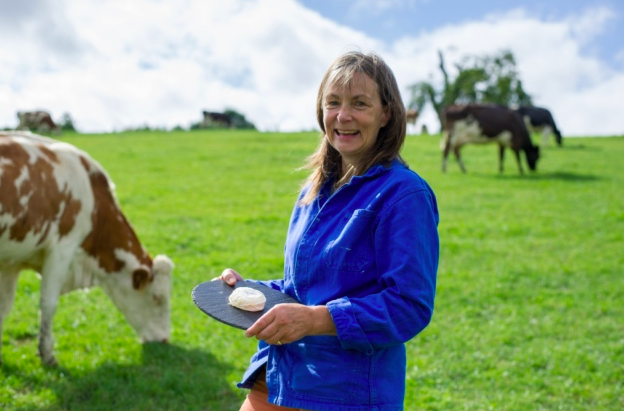 Julie learnt to milk cows when she was 16 years old and her cheese-making experience began in 2005 when she partnered by with her friend Stacey Hedges and created the first Tunworth. She has since started her own production using milk from the Montebeliarde herd of Jonny Crickmore’s farm and created St. Jude: the flavours of the pasture are intact giving the cheese an earthy richness becoming more evident as it ages. This little cheese is a lot like Saint Marcellin from the Rhone Alpes, but with a sappy, savoury Suffolk sensibility. 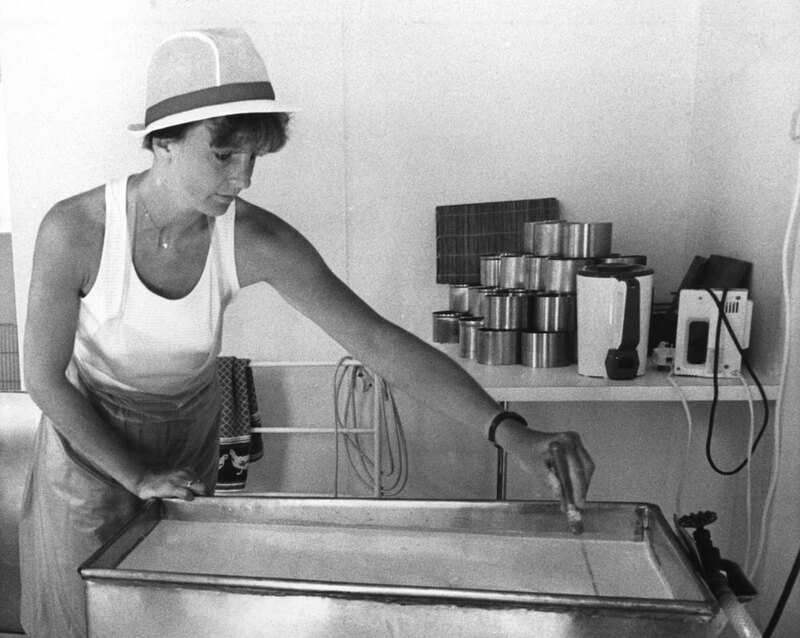 Anne began making cheese at the National Institute for Research in Dairying (NIRD) in 1984, having worked as a microbiologist at the establishment. In the experimental dairy Anne produced different types of cheese for projects within the institute and organised tasting panels. She also visited the then few artisan cheese-makers in the country for consultations and this inspired a passion for artisan cheese. Inspired by the Pecorino Sardo she tried while on a sailing trip in Sardinia, she began making cheese as Village Maid in 1986, developing the recipe for Wigmore in the early 1990's. A bloomy rind, semi-soft cheese - the sappy, fruity, rich flavour is quite sharp and crumbly when young, but with maturing the edges begin to melt, transforming it into a velvety, rich mellow-tasting cheese. Mary and her husband Michael have been making cheese since 2005 using milk from their Friesian and Red Poll herd (today Mary makes the cheese with her son Joe, while her husband Michael milks the cows with son Ross). The pate of their Cote Hill Blue has a rich, creamy quality, and due to the cellar-maturation the rind develops natural blooms, imbuing the interior roqueforti moulds with a distinct earthy, mushroomy quality.